Pupils at a grammar school in Lisburn are being encouraged to swap notepads for iPads. 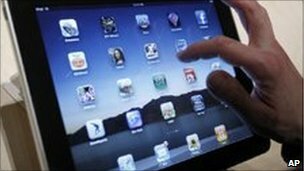 Wallace High has negotiated a leasing deal for the computer tablets made by Apple which will cost parents £170 a year. A total of 530 pupils in years eight to eleven at the school will be able to use the new iPads in class and take them home. The super slim computers can be used for internet research, playing music, photographs and reading books. The school will use its own technology staff and budget to provide applications for the pupils to use. It is understood there will be special insurance for the iPads as well as tracking software in case they are lost or stolen.